But everywhere else in Europe, the practice of Islam really is outstripping Christianity, while Jews are leaving — not only France but the old continent — en masse. In January, Zvi Ammar, the president of the Marseille Israelite Consistory, recommended that Jews that stop wearing a kippah (skullcap) when out in the street. Too many anti-Semitic incidents have cast fear into the hearts of Marseille’s 70,000 Jews, who make up a tenth of the city’s population. 500 Jews already left the city in 2015. A few days ago, Mr. Ammar announced another attempt at appeasement: the conversion of a historic synagogue into a mosque. The synagogue Or Torah [“light of the Torah”] was bought by the Muslim organization Al Badr for 400,000 euros ($456,000). The synagogue was empty, due to rampant anti-Semitism in Marseille, while the nearby mosque, run by Al Badr, was unable to handle the overcrowding every Friday, with the faithful forced to pray in the street (a quarter of the inhabitants of Marseille are Muslim). Muslims in Marseille already have 73 mosques. A year ago, the Muslim French leader Dalil Boubakeur suggested turning empty churches into mosques. It is the first time in France that something similar happened to a synagogue. “History teaches us that these transformations are rarely innocent,” said Bertrand Dutheil de La Rochère, an assistant to Marine Le Pen, leader of the National Front party. 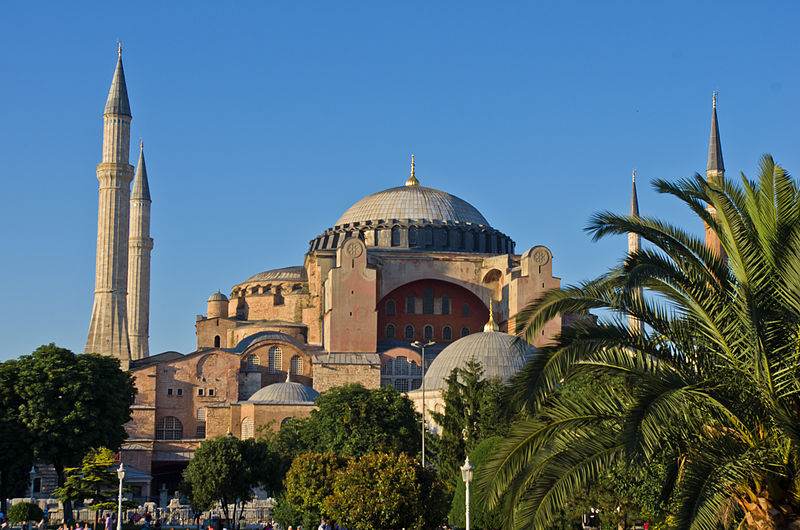 He appeared to be comparing the fate of the synagogue to that of the Hagia Sophia Basilica, which became a mosque in Constantinople (now Istanbul) in 1453, after its capture by the Muslim Ottoman Turks. “What should we do?” Zvi Ammar asked this author. Zvi Ammar, however, is right: not only is the Middle East full of synagogues turned into Islamic sites, but also of churches converted into mosques, such as the Umayyad in Damascus, the Ibn Tulun in Cairo and the Hagia Sophia in Istanbul. In Hebron and on Jerusalem’s Temple Mount, Muslim conquerors built their sites atop the Jewish ones. A few years ago, Niall Ferguson, the brilliant contemporary historian, wrote about Europe’s future as “the creeping Islamicization of a decadent Christendom.” It is easy to find images of the decay of Europe’s Christianity and the growth of Islam in the heart of the old continent. Every traveler in any modern European city can notice the new mosques being built alongside abandoned and secularized churches, some converted into museums. The most crucial moment in Michel Houellebecq’s novel, Submission, is when the novel’s protagonist, a Sorbonne professor searching for a conversion experience, visits a Christian shrine, only to find himself unmoved. This is a reality in France. In the French region of Vierzon, the Church of Saint-Eloi has become a mosque. The diocese of Bourges had put the church on sale, and a Muslim organization made a most generous offer to buy the site. In the Quai Malakoff, in Nantes, the old Church of Saint Christopher became the Mosque of Forqane. In the Dutch province of Friesland, 250 of 720 existing churches have been transformed or closed. The Fatih Camii Mosque in Amsterdam once was the Saint Ignatius Church. A synagogue in The Hague was turned into the Al Aqsa Mosque. The Church of St. Jacobus, one of the oldest of the city of Utrecht, was recently converted into a luxury residence. A library just opened in a former Dominican church in Maastricht. Belgium, once a cradle of European Catholicism, is closing dozens of its churches. The Church of St. Catherine, built in 1874, dominates the historic center of Brussels, the only religious building created in the city’s “pentagon” at the end of Ancien Régime, and today one of the most protected in the EU’s capital, especially after the terror attacks there on March 22, 2016. Brussels, however, wanted to convert the church into a fruit market. Only the mobilization of the faithful hindered the city’s plan. Last month, The Economist explained what is happening in Belgium, once famous for the Madonna of Bruges, one of Michelangelo’s most famous paintings: “If anything holds Belgium together through its third century of existence, Catholicism will not be the glue,” the magazine wrote. That, it noted, will be Islam. In Brussels, half the children in state schools choose classes in Islam; practicing Catholics amount to 12%, while 19% are practicing Muslims. According to La Libre newspaper, dozens of Belgian churches are in imminent danger of conversion to other uses. The Church of Saint-Hubert in Watermael-Boitsfort is expected to accommodate apartments, while the Church of the Holy Family of Schaerbeek awaits an investor. In Malonne, the chapel of Piroy has been transformed into a restaurant. In Namur, the Saint-Jacques Church was transformed into a clothing store and the Church of Notre Dame, built in 1749 and deconsecrated in 2004, is now a “cultural space.” The square will be redeveloped, with ticketing services and catering. Dozens of exhibitions, concerts and fashion shows have already been held in the church. In Tournai, the Church of St. Margherita has been transformed into apartments. Eight centuries after its founding, the Church of the Blessed Sacrament at Binche, a majestic building in the heart of a medieval town close to Brussels, was put on sale for the symbolic sum of one euro. In Mechelen, Flanders, in place of a famous church, a luxury hotel has arisen. Catholic arches, columns and windows still soar between menus and tables for customers. Despite the fact that the “Pope Emeritus,” Joseph Ratzinger, comes from Germany, that Chancellor Angela Merkel is the daughter of a Lutheran minister and the current German president, Joachim Gauck, is a Protestant pastor, Germany is literally selling its churches. Between 1990 and 2010, the German Evangelical Church closed 340 churches. Recently, in Hamburg, a Lutheran church was purchased by the Muslim community. In Spandau, the church of St. Raphael is now a grocery store. In Karl Marx’s town, Trier, some churches have been turned into gyms. In Cologne, a church is now a luxurious residence with a private pool. The writer Emile Cioran once cast a sinister prophecy on Europe: “The French will not wake up until Notre Dame becomes a mosque.” Five years ago, a French historian, Dominique Venner, shot himself on the altar of Notre Dame, Paris’s most famous Cathedral. This suicide, which the mainstream media dismissed as the gesture of a Catholic crank, was a terrible warning to Europe. But no one was paying attention.